Black Goji Berries need to grow on the high altitude, dry weather, natural with no pollution desert areas. It enjoys a good geographical location, an altitude of 2700-3000 meters and sunshine up to 3600 hours per year. Distributed in the sand banks on mountain, dried riverbeds and deserted riverside, it is recognized as the unique medicinal desert plants in western area of China(Qinghai / Xinjiang). 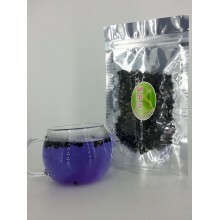 As black Goji Berries grow wildy in extremely tough environment (barren, riverbed and sand) where human being could hardly live, which are high medicinal value plants and the sources are very rare and valuable, the price stays very high. Black goji berries are rich in protein, 17 amino acid, 13 kinds of vitamin, minerals, trace elements and other nutrients. The most important thing is Black Goji Berries contain the anthocyanins. Anthocyanins can remove free radical inside our bodies. The effect is 20 times more than Vitamin C and 50 times more than Vitamin E. Healthy Station’s Black Goji Berries contain 2100mg/100g serving of anthocyanins (report number LRN:FD0151007) and pass the heavy metals test (report number LRN:FD0151006)(1). Our black goji berries are wild and pure natural dried fruit products. The contents of its anthocyanins is 4-84 times more than blueberries(2). Black goji berries was found containing the highest anthocyanins among the natural plants, the most effective natural antioxidant in anti-aging and keeping young. Clinical report shows anthocyanins can regenerate retinal pigment of retinal cells, can prevent serious myopia and retinal detachment, and can improve vision in dim light, good for driving at night and also good for always watching monitors. 2.) Contain potent antioxidant which prevents aging, keeps young, energetic and being effective in inhibiting the wrinkles. 1 Drink: Take a teaspoon of Black Goji Berries and put it into a cup of warm water (below 60。C) for about 5 minutes and finish it as soon as possible. Warm water can be refilled until the color of the water fades. Then Black Goji Berries could be eaten (after release the nutrients and anthocyanins of the Black Goji Berries, part of them will turn slightly transparent). 2 Eat: Eat directly. Should be slightly sweet and the taste like raisins. From reference: Lauro, G.J. and Francis, F. J. (Eds) Natural Food colours, Science and technology. IFT Basic Symposium Series 14, Marcel Dekker, 2000.